That must be more convenient than having to change batteries after several hours. What parts are involved, from the electric wall plug to the final motor? 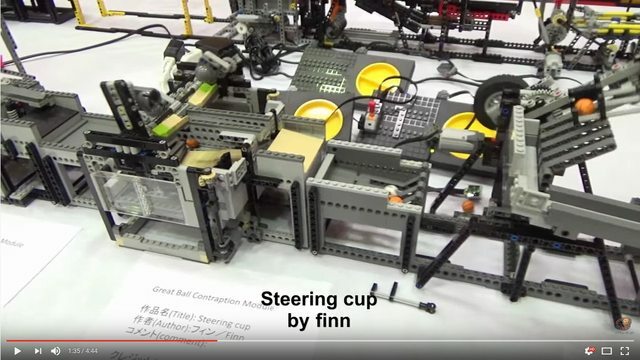 If I remember correctly, I have already seen in some videos that the Technic Control Center II (2840c02) was used in place of Train Speed Regulator. Does it work too? The Train Speed Regulator 9V are Technic Control Center II are incredibly cheap, are they the cheaper way to power devices from an electric wall plug? The Power Adaptor is relatively expensive, but it's probably possible to find a cheaper and compatible adaptor. What you describe is indeed the most common way to GBC modules, but it's worth noting that one adaptor+regulator can typically power more modules (it depends on the modules), sometimes only one end of the extension cable is used, when placed on the regulator, it effectively provides a power functions "plug", and if you want to power more modules, the wiring can get a little easier to handle, when every module is essentially connected to a regulator. Another option is an NXT with the official rechargable battery mounted and an adaptor plugged in, and then of course NXT cables to an NXT motor (I don't remember if NXT->PF cables exists, but NXT->9V cables does and you have mentioned that the PF extension cables can attach to 9V). I have also seen modules with an RCX, I think that has a plug for an adaptor directly, but I'm not sure, I don't think I've seen GBC modules powered by EV3's yet, but there's probably a solution. - Probably more expensive, but having an NXT in a module allows other possibilities, especially if you also put in some sensors. As Mr. Shiny and New 安宇 mentions the rechargable battery box is a third solution. All of these solutions have the advantage that they only use official unmodified LEGO parts. I just happened to finish a homemade solution to this problem a few days ago — so while I can say this works, it isn't exactly long-tested. I made an adapter to connect a 9V power source to the battery contacts in a regular Power Functions battery box. 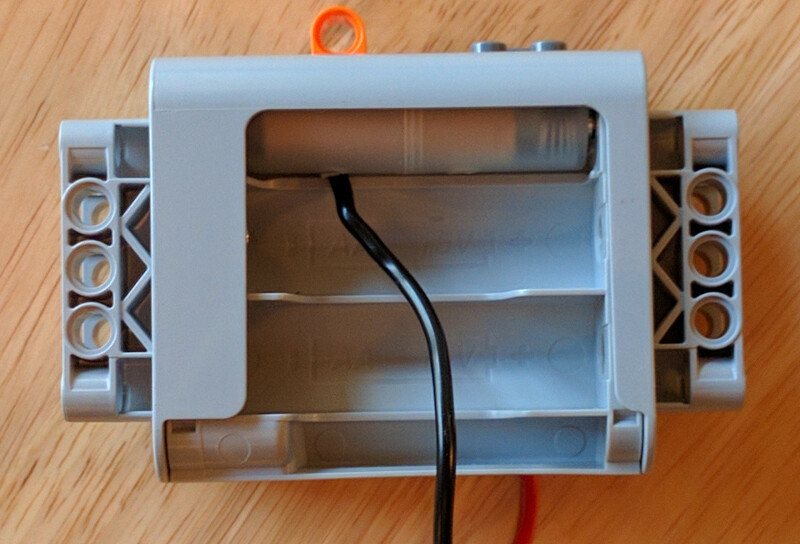 The trickiest part is making the connection to the positive terminal of the battery box (which is a recessed flat contact as opposed to a spring). There are lots of ways the details of this could be handled, depending on the materials and tools available. I used two AAA-to-AA battery size adapters that I had on hand — for this purpose, they're just battery-shaped plastic objects with contacts on the ends. One of them has only the negative end connected, and the other has only the positive end. 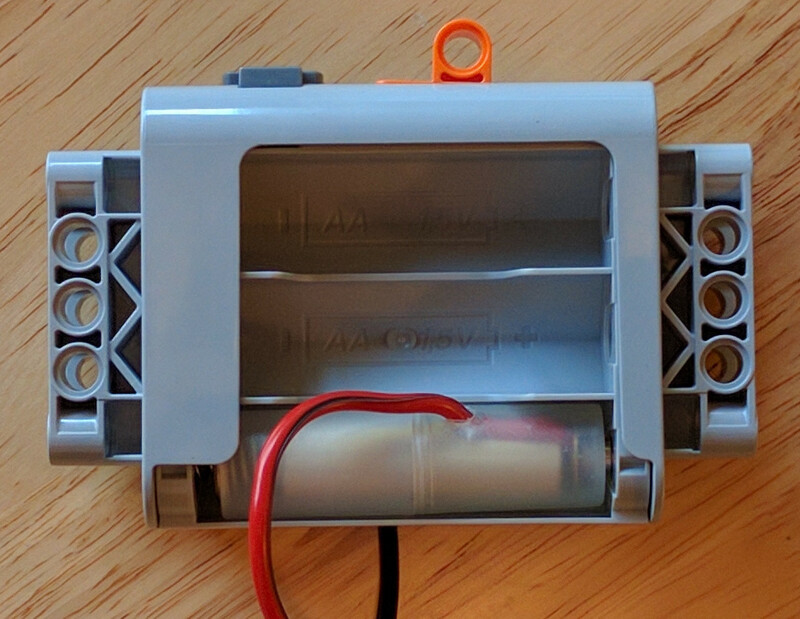 The two “batteries” go into the “endmost” slots in the battery box — these are the two that are closest to (negative end) and farthest from (positive end) the switch, paying attention to the zigzag shape of the two sides of the box. These are the two slots that are actually wired to the switch and output; the rest are just to make connections between six separate cells, which we don't need. Two AAA-to-AA adapters, with holes made in the sides for the wire. Wooden dowel, to fill out the interior space, with a groove cut in the side to make room for the wire. Ordinary brass thumbtack, pressed into the contact end of the dowel. Wire, soldered to the inside of the tack. There are surely much less complicated ways to do this, such as not bothering with the plastic adapter, though then you need to be more precise about making things the right size. Cheap if you have the right materials on hand. You get the reverse/off switch and overload protection circuit that's in the battery box (unlike, say, cutting a Power Functions wire to make direct connections, which would also work). No bulky speed control box if you don't need it. The same adapter can power an old-style 9V battery box, a Mindstorms brick, or anything else taking 6 AAs. 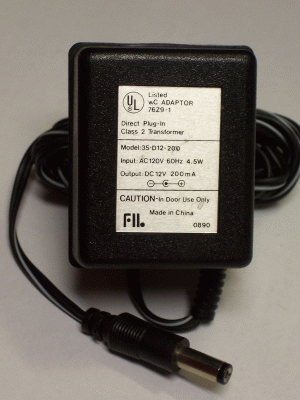 Not an official LEGO power adapter. Might be stressing the battery box due to long-term higher voltage than AA batteries under load. You get no speed control (if that's something you care about). Ugly; you have a battery box with the covers taken off. I've heard that the rechargeable battery box sold by LEGO can power a motor while it is plugged in and charging. If your motor is in a stationary position, this could be sufficient. 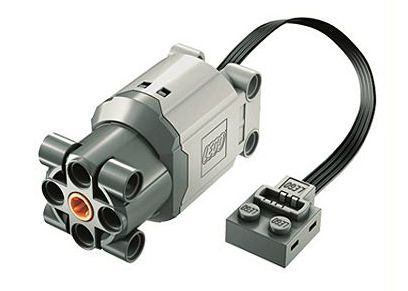 I've also read, in customer reviews on the LEGO website, that it is possible to daisy-chain power-function devices to the old 9V motors, however, I'm not quite sure what is required for that. Not the answer you're looking for? Browse other questions tagged technic motors trains power-functions or ask your own question. What parts are really required to motorize 10219 Maersk Train? Does the Power Functions IR Remote Control 8885 make a good remote for a car? How to run two LEGO electric trains at the same time? What prevents a 12V motor, when pushed by hand, from providing DC electric out?